Our Palm Harbor residential and commercial clients want amazing-looking, healthy, sustainable lawns 24 hours a day, 7 days a week. They choose Sunrise Irrigation because that’s our goal, too. It’s one of the main reasons we are the #1 sprinkler and irrigation service in the area. But showing off your lush, beautiful lawn after the sun goes down can be a challenge. Regular lighting options just don’t cut it. Traditional outdoor lighting tends to be invasive. Bright lights slice into the night, obscuring the very things you want illuminated. Harsh shadows. Glare. It is enough to make even the best-looking lawn appear average at best. 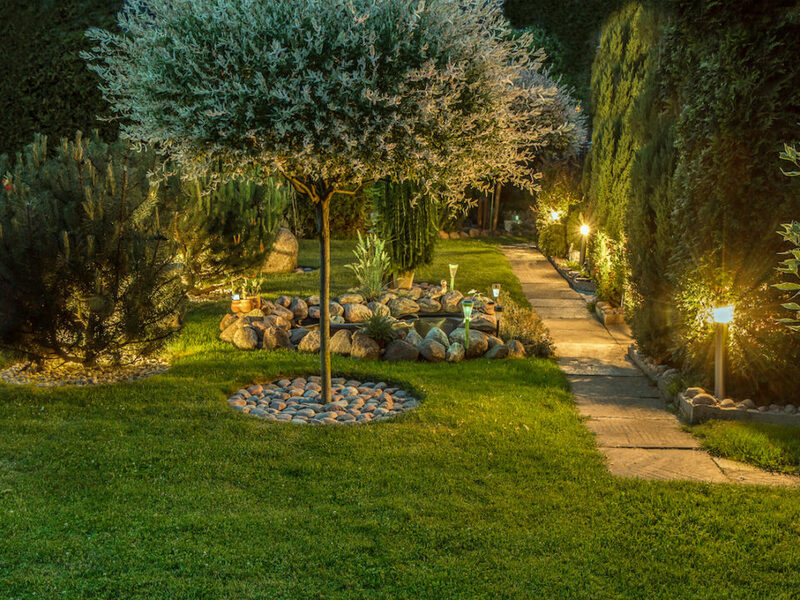 To keep your lawn looking its best at all hours, you need lighting specifically designed to do just that. You need Sunrise Irrigation’s landscape lighting. Imagine your yard covered in a soft glow during all hours of the night. You could sit under the stars and enjoy a twinkle of soft, cool light all around your property. Twilight and sunset hours no longer need to be disturbed by a bright, annoying lamp that distracts your eyes from the beauty of our Florida sunsets. When you opt for landscape lighting from Sunrise, you will transform your entire property with custom illumination designed to highlight your lawn’s best features while maintaining a low-key presence. You set up an appointment for us to check out your yard. We examine your entire property to determine the best way to properly connect and set lighting so it encircles your property in a dazzling glow. 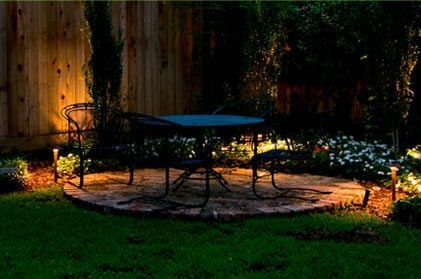 We also note your yard’s unique features and areas that should be highlighted with carefully placed lights. 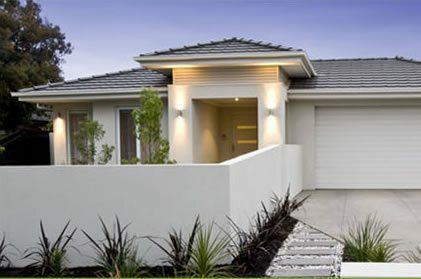 We then go over the options with you and work together to come up with a landscape lighting plan based on the individual layout and features of your property, your desires, and your budget. We service the entire Tampa Bay Area including Palm Harbor, Clearwater, St. Petersburg, Tarpon Springs, and beyond. Sunrise has been bringing experienced irrigation professionals to homes in the Tampa Bay area for over 20 years with the goal of making lawns healthy and beautiful through efficient and sustainable means. Our landscape lighting professionals have the same goals. Our experts have valuable experience working with customers around the Tampa Bay area, and understand how to set each yard, property, or home apart with innovative designs. You can trust Sunrise to provide you with personalized, professional services for prime curb appeal. To see how Sunrise can bring your landscape dreams to life, browse through our gallery for inspiration and ideas. Or learn more by getting in touch with us to set up a free consultation and estimate. Simply fill out our easy online contact form, email us at contact@sunriseirrigationandsprinklers.com, or call 727-772-3819. There are many reasons to install landscape lighting at your home or commercial business. Ensure security and safety during all hours. Landscape lighting makes your property safer and more secure, whether you are entertaining guests or customers, away on vacation, or simply tucked in bed. Planned placement and custom highlighting will allow guests to traverse your yard safely, avoid obstacles more easily, and see where they are going – no matter how late it gets. If you install lights lining your driveway, it improves visibility when you arrive home at night. Lights that surround the backyard and your property’s most visited areas allows everyone on your property to travel confidently. 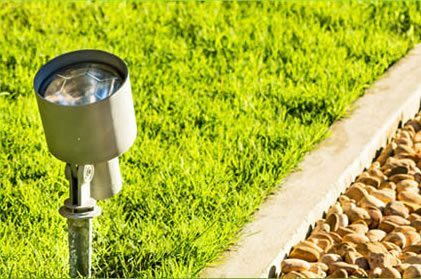 And once our LED lights are installed into your landscape, the property will always look occupied – regardless of where you actually are! In other words, landscape lighting is a fantastic deterrent against criminal elements and even animal invaders. Save money, save the Earth. Keeping the lights on is crucial to your safety and security, but you may already be calculating your energy bill in your head. Sunrise is dedicated to keeping your lighting plan efficient, with both the environment and your energy preferences in mind. Case-in-point: our low-voltage LED landscape lights use 75% less energy than traditional outdoor bulbs. This means that you will not only be able to save money on your utility bills, but also feel good for choosing an Earth-friendly, green lighting option. 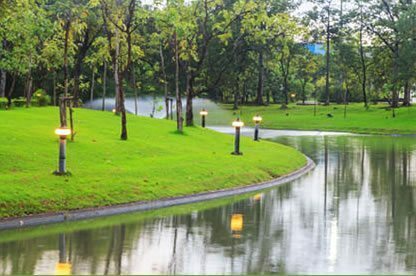 The beauty of landscape lighting is that it is not just a gorgeous form of décor and a way to keep your property safe and secure – it is a way to make money. How so? Because well-done landscape lighting can easily increase the value of your property. It also gives you the potential for more photo options if you ever decide to sell, because your new lighting will make your property look incredible at any time of the day or night. Stunning night photos can wow potential buyers and set your property apart from others selling in the neighborhood. No one wants to enter a commercial business at night if it looks dark and potentially dangerous. Businesses that are not well-lit can be magnets for criminal elements, and people know it. In contrast, a beautifully-lit landscape encourages people to come in and stay a while, as well as serving as an advertisement to how clean, well-maintained, and safe your property is. Eliminate snaking cords and wires. When you have us professionally install landscape lighting, you can say goodbye to having those ugly extension cords all over your lawn. Our fixtures will be installed where you want and need lighting in your yard, and you will never have to worry about using cords to supply power. This not only makes your landscape look better, but also improves safety, because there is nothing to trip over. If parts of your yard are dark at night, you cannot use them. It is as simple as that. By adding carefully placed landscape lighting, it is possible to expand the usable space you have, opening up your property and potentially adding more areas for entertainment.